Big, big, big news! 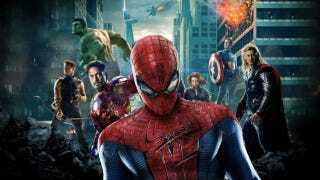 Spider-Man will no longer stand alone in Sony pictures, Peter Parker WILL be joining the Marvel Cinematic Universe. Updated Now With More News! "Sony Pictures will thereafter release the next installment of its $4 billion Spider-Man franchise, on July 28, 2017, in a film that will be co-produced by Kevin Feige and his expert team at Marvel and Amy Pascal.... Together, they will collaborate on a new creative direction for the web slinger. Sony Pictures will continue to finance, distribute, own and have final creative control of the Spider-Man films. WHAT DOES THAT MEAN? It could mean that we're getting a whole new Spider-Man franchise, or another Andrew Garfield movie, or maybe even that Sinister 6 film that's been kicking around forever. UPDATE: Buzzfeed is reporting from unnamed sources that Andrew Garfield will be recast. However, July 28th 2017 was originally set as the date for Marvel's Thor: Ragnarok, but now that's changed. UPDATE: Marvel also just announced that Thor: Ragnarok will now hit theaters on November 3, 2017. Black Panther will premiere on July 6th, 2018, Captain Marvel on November 2nd 2018 and Inhumans on July 12, 2019. All other dates remain unchanged (so far) . No doubt this shuffle was due to the Spidey assimilation. Honestly, we're inclined to think that just about anything Sony was previously developing is most likely thrown out the window, including spin-offs. And Marvel will no doubt be taking the wheel on the character's development from here on out. Especially with this line so clearly printed in the Marvel release, "Together, they will collaborate on a new creative direction for the web slinger." That's big. Oh and also, Spider-Man coming over to Marvel may lead the way for other Marvel characters showing up in Spider-Man movies as well "Marvel and Sony Pictures are also exploring opportunities to integrate characters from the MCU into future Spider-Man films." Anyone else expecting big things from the Marvel Civil War movie (set to release on May 6, 2016)? Holy Cow.